Wilburton and surrounding area offers spectacular scenery that will thrill even the seasoned traveler. Drive or hike through several mountain ranges - the lush Kiamichis, the scenic Jack Fork Mountains, or the beautiful San Bois range. The history of Wilburton dates to before statehood, when the region was known as Indian Territory. The end of the Civil War heralded the beginning of a period of lawlessness. Robbers Cave became a rallying point for all sorts of scalawags, ne'er-do-wells and criminals who used the area for a giant game of hide-and-seek with the law. It is rumored that loot they carried in from Texas is still buried here. (Ask locals about the ghost of Fiddlin' Jim). 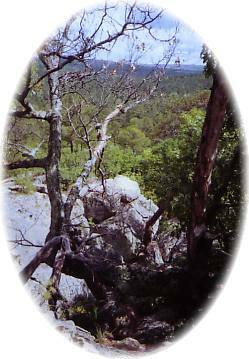 From 1870 to 1890, Robbers Cave was notorious for its association with the likes of Jesse James, his cousin Cole Younger and Cole's Wife, Myra Belle Shirley, later known as Belle Starr. The re-establishment of order in Indian Territory and the placement of Hanging Judge Isaac Parker on the bench at Ft. Smith brought this brief but tempestuous period to an end. Five miles from Wilburton you'll find Robbers Cave State Park, one of America's most magnificent works of nature's art still begging for exploration. Facilities include Silver Dollar Cafe, Belle Starr Vista Lodge, and cabins and camp sites. Stables and on-site horse rentals are available. Boating, fishing and swimming are available at two lakes in the hills of the park. The third weekend in October brings more than 65,000 visitors to attend the Robbers Cave Fall Festival, arts and crafts, one of the largest car shows in Oklahoma, and a parade. Eastern Oklahoma State College offers something for every student. Full of academic challenges, and numerous activities and organizations to choose from, an Eastern student is sure to find something that will fit his or her needs. Ride the Trails and explore the caves made famous by notorious outlaws such as Belle Starr, Cole Younger, and the James Brothers, located in the beautiful Robbers Cave State Park in Wilburton, Oklahoma. Latimer County Golf Course is a semi-private, 9-hole course that is open year round with an open guest policy.